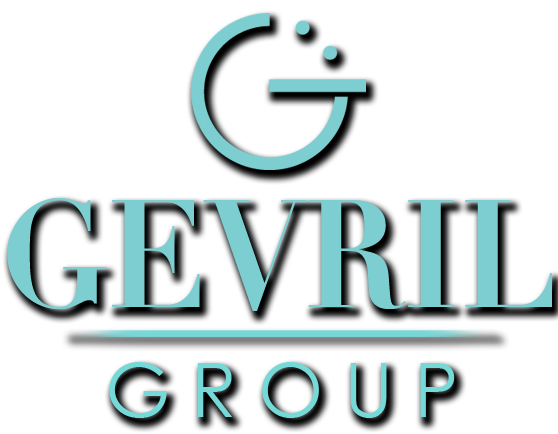 The repeating wristwatch represents the pinnacle of the watchmaker’s art. These complex mechanical wonders sound the hours and minutes at the touch of a button using an intricate system of gears, wires and miniature bells. The first five-minute repeater watch was created in 1710 by Samuel Watson and the basic design has not changed much since. Due to the difficulties involved in producing this ultimate mechanical complication, the repeater watch has traditionally been a status symbol reserved for the very rich. 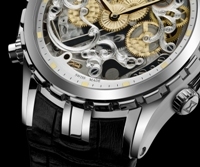 Repeater watches are typically made by hand and can cost hundreds of thousands of dollars. 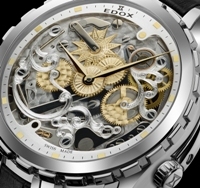 That’s why there was such excitement when Edox introduced its latest special edition: the Cape Horn 5 Minute Repeater. Produced in an exclusive limited edition of only 30 pieces worldwide, the Cape Horn 5 Minute Repeater is a genuine masterpiece that looks 2-3 times more expensive than it actually is. 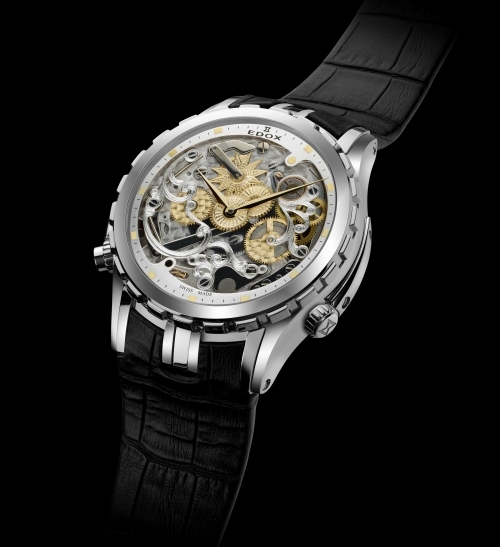 The skeletonized movement is assembled by hand in accordance with the finest watchmaking traditions. 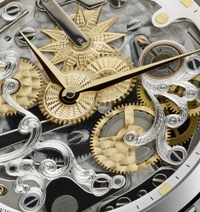 The gears and bridge assembly of the exclusive Edox caliber 87 movement are beautifully hand engraved and decorated to create a timepiece of exquisite beauty where the inner workings can be viewed from both sides of the watch. With a fully skeletonized front and a porthole on the back to reveal the balance wheel, the mechanical intricacies of this exclusive watch will fascinate watch aficionados for hours on end. Based on the famous ETA 2892-A2 base caliber movement, the caliber 87 adds an additional Dubois-Depraz module for the repeater complication. Dubois Depraz complications are considered by many to be the Ferrari of the watch world and are used on only the finest luxury watches. Two different hammers, one for hours and the other for minutes create two distinct tones to strike the time on demand. With a 45mm 316L surgical stainless steel case that is water resistant to 330 feet, you could wear the Cape Horn 5 Minute Repeater anywhere. You probably won’t however. The watch is simply too beautiful. A striking notched bezel surrounds the anti-reflective sapphire crystal, providing an unobstructed view of the hand-assembled movement. Each watch is equipped with a special plate on the case flank displaying the unique edition number. If you would like to be one of only 30 lucky people who will be able to wear this exclusive family heirloom on your wrist, contact your Edox dealer immediately.